Simon Lambert is back in action tonight. Star reserve Simon Lambert is determined to inspire Peterborough Panthers to success in front of the nation tonight (June 24). 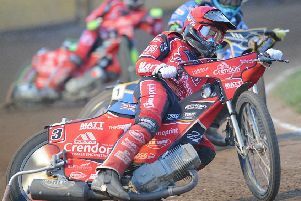 Lambert returns from a brief injury lay-off as the city racers entertain fellow Premier League title hopefuls Glasgow Tigers in a televised clash at the East of England Showground (7.30pm). Lambert suffered concussion and severe bruising after being caught up in a four-man spill in the club’s triumph at Newcastle 10 days ago and missed their KO Cup exit at Plymouth in their last meeting. But he is raring to go again tonight and determined to get straight back among the points as Panthers attempt to leapfrog their visitors into third place in the standings. Lambert said: “I don’t remember anything about the crash which is probably the best thing although I have had a look at it since. “I was an innocent victim in all honesty, but crashes are just part of the sport. I had some bad headaches and vision trouble for a few days, but I’m fine now. “The downside of it is the cost of putting things right and it has probably cost me somewhere in the region of £1,500 to get things sorted after the crash at Newcastle. “My job tonight is to pick up from where I left off and score points. It is going to be a tough meeting against a strong Glasgow team, but we just need to get a result. “It is all about winning speedway meetings regardless of whether or not the TV cameras are there. “We slipped up against Ipswich in our last home meeting and we can’t afford to be beaten at the Showground again. “We bounced back really from that loss by winning at Newcastle a couple of days later though and now it is a case of kicking on. “Speedway is a confidence sport and the majority of us have been bouncing off one another. We have a fantastic unit with a great team spirit which really helps. “My own form has taken me by surprise a bit. I’m loving it at Peterborough. The fast track suits me, the fans are great and so is the promotion. Lambert’s return is a major boost to Panthers as he has been a reliable source of points throughout the campaign. Fellow reserve Ollie Greenwood makes a farewell appearance for the club tonight. He has been released by mutual consent to seek a fresh start elsewhere after struggling for form. Panthers again turn to regular guest Brady Kurtz of Somerset to slot in at number one. The Australian teenager has already delivered a series of high-scoring displays when borrowed by the club. A man who helped Panthers to Premier League glory back in 1998 features in the opposition team tonight. David Howe was a teenage talent when the city club last ruled supreme at this level. Now 33, he has just been snapped up by Glasgow after leaving Scunthorpe. Tigers reserve Dimitri Berge’s father, Philippe, also rode for Panthers in their 1998 title season. PANTHERS: Lewis Blackbird, Ollie Greenwood, Brady Kurtz (guest), Robert Lambert, Simon Lambert, Ulrich Ostergaard, Michael Palm Toft.